When the winter months start and it starts getting dark earlier, it is important to take extra care to ensure that you and your dog are safe. Whether you are cycling or walking, visibility contributes to your safety. It is important that both you and your dog are highly visible. We will discuss this further in this article, as Vetsend has various products in its range to ensure a better visibility, including safety lights, reflective lines and safety vests, to ensure that every dog is highly visible in the dark. To make your dog highly visible, there are various options available. These includes reflective dog leads or collars. Many collars and leads now have reflective strips on them as standard. The disadvantage of reflective strips is that these are only visible when there is a light shining on them. For a better visibility, there are also collars and leads available with reflective strips and a bright neon colour. The combination of the yellow neon colour and the reflective strips is more visible in the dark (an example of this is the Flexi Neon Tape Leash. There are also collars and leads with LED lighting. Thanks to the LED lighting, your pet is constantly visible. These collars and leads require batteries and can often be set to a flashing or constant light setting. For the Flexi Vario Tape Leash there is an extra expansion available in the form of a (flash) belt. Aside from the reflective and light-up collars, dog winter coats, dog leads and dog raincoats, reflective/ safety vests are also available for dogs. Because a safety vest is worn around the dog's body, your dog will be more visible wearing this than if it's just wearing a collar. The vests have a bright neon colour with reflective strips and are easy to attach. The AFP K-Nite Reflective Jacket is an example of this. The little safety lights, such as the Orbiloc (photo) or the EzyDog Adventure Light, are perfectly suited to be attached to your dog's collar or harness. 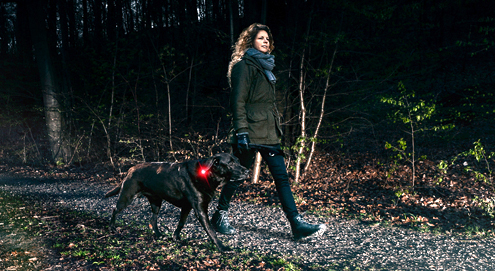 With these handy lights, which can often be set to a flash or constant light setting, your dog will be highly visible. When you walk several dogs, it is useful to put a light of a different colour on each dog. This allows you to keep the dogs apart in the dark. The lights are also waterproof, so you can use them when you go for a walk in the rain. Aside from being seen, it is just as important to be able to see in the dark. That is why a torch is a handy tool to bring on walks. Flexi has developed a handy light system to attach to the Flexi tape leashes, the Flexi Tape Leash Vario - LED Lighting System. This handy lamp looks a little like a torch and projects a white light forwards and a red flashing light backwards. When it's getting dark outside and you're not done playing with your dog, get a light-up or glow-in-the-dark ball. If you want to try a new route with your dog, walk it in the day first. This means that you will be well prepared when you walk it in the dark. Don't just make sure your dog is highly visible in the dark, equip yourself as well. You can do this by wearing reflective clothing or an extra light on your coat. Always keep a close eye on the traffic! Not all drivers will see everything and not every cyclist has enough light on their bike. Walk on well-lit footpaths or cycle paths where possible and try to avoid unlit, secluded paths. Make your dog more visible at dusk and in the dark. Safety lamp for your dog. With neon colours for extra safety in the dark. Ideal for dogs with a long and/or thick coat. Lighting system for the Flexi Vario Retractable Leash. Making your dog more visible in the dark. Highly visible and reflective safety jacket. Add LED Flash Belt to the Retractable Leash for extra visibility.